Conshohocken, Pa (May 27. 2017) – The line from “Field of Dreams” is famous for bringing baseball’s past back to life, but it has since been applied to many endeavors. The China Arena Football League is about to give birth to professional football in China in the Autumn of 2016. To accomplish that, the CAFL needs to attract some special players – pioneers, ambassadors, teachers of the sport. 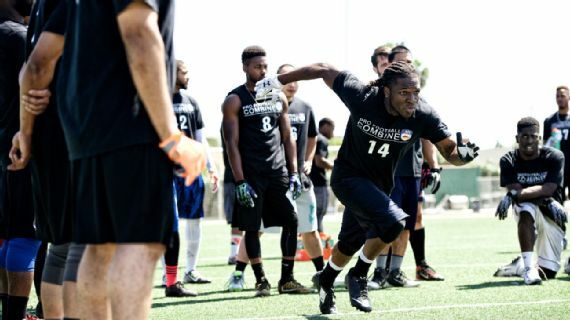 The coaches and scouts of the CAFL have been “building it” through tryout camps and combines throughout the world. And the world is starting to take note. Take the excellent article below, for example. It’s from ESPN. ANAHEIM, Calif. — The gate to the parking lot was still tightly chained when Donald Hamilton rolled up about an hour after sunrise. He eased to the curb with his three young daughters still fast asleep in the back seat of his gray sedan. His girlfriend of 10 years, Amber Hutchins, rested comfortably on the passenger side. Hamilton had driven most of the night from his home in Chandler, Arizona, to Anaheim’s Servite High School, and whatever weariness he felt on the inside was masked on his youthful-looking exterior by adrenaline. 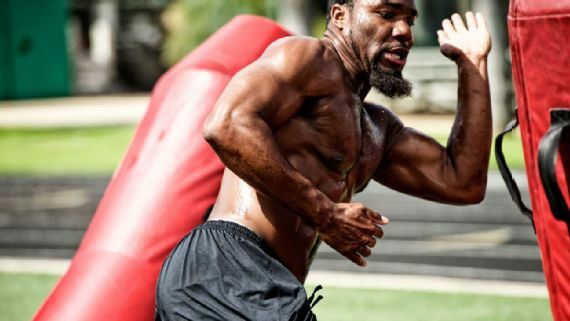 His lifelong pursuit of a professional football career was handed another oxygen tank by the China Arena Football League, and the 29-year-old slot receiver wasn’t about to let this opportunity pass him by. “Seems like, in America, it’s more about who you know and who can help you get your foot in the door,” Hamilton said. “I might as well try something overseas and showcase my talent.” As the six-team CAFL prepares to debut with its first full schedule this fall, tryouts were held in Anaheim and Austin, Texas, in hopes of attracting and identifying North American talent to help build the league. The CAFL will be the first professional American football league in China, a country that has invested significantly in global sports entertainment in recent months. Approximately 60 percent of each team’s roster will consist of Chinese citizens, and the remainder will come from North America. A series of tryouts were held last month in China to evaluate the homegrown talent. The inaugural draft is scheduled for June 10, and the first games will be in October. With his 30th birthday on the horizon, Hamilton is aware that his window of opportunity is rapidly closing. That’s why he didn’t take any chances and arrived an hour before registration at the Catholic school located about 4.5 miles northwest of Disneyland. His determination likely won’t go unnoticed. “Those are the guys we’re looking for: the guys who really want it,” Ed Wang, the CAFL’s vice president of development, said. Hamilton, who attended Western Kentucky and Boise State but didn’t play college football, was initially skeptical about an American football league surviving in China. After all, he joined a number of semi-pro and small arena league teams around the southwest, and often they abruptly disbanded. “They make it to four games and fold,” Hamilton said. “Someone takes off with the money.” But the more Hamilton learned about the CAFL, the more he became convinced the organization had a business model that could flourish and an untapped fan base that should easily support half a dozen pro teams. Hamilton didn’t waste any time filling out his first passport application and notifying his employer that he might be taking an extended leave this fall. “It’s his dream to be a football player,” Hutchins said. “Even if it’s just to get a chance.” The CAFL was the brainchild of Martin E. Judge, the founder and CEO of a Philadelphia-based professional services company. He is a part-owner of the Philadelphia Soul of the U.S.-based Arena Football League, and in 2012, he formed AFL Global with ESPN analyst and former NFL quarterback Ron Jaworski, also part-owner of the Soul. The Chinese government awarded AFL Global the rights to bring an arena league to China, and its first exhibition game was played before 6,000 fans in the fall of 2013. The league picked up further momentum two years ago with the hiring of Wang, a fifth-round draft pick by the Buffalo Bills in 2010 and the first Chinese-American player to be drafted and play in the NFL. Wang is a key evaluator of China-based talent, and he attended both U.S. tryouts. He said he was looking for many of the same characteristics, regardless of whether he was watching a player in Anaheim, Austin or Beijing. “We’re looking for good character guys,” Wang said. “It doesn’t matter if you played in the NFL, the AFL, college ball. 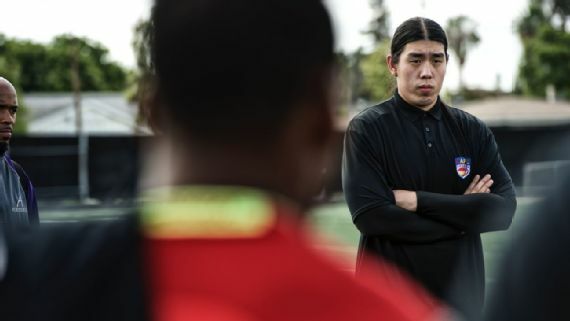 … We’re looking for guys who fit what we’re doing.” Tsu Lam, 33, of Rosemead, California, had never donned a helmet or shoulder pads, but he was among the several dozen prospects at the Anaheim tryout. His mother didn’t allow him to play football when he was younger because she considered the sport too dangerous. She might have been right, Lam said, considering he weighed no more than 120 pounds in high school. But he’s about 50 pounds heavier now and believes he has the ability to compete in China, especially after viewing online videos of some exhibition games involving Chinese nationals. “I think I can handle their athleticism,” he said. Lam is waiting to hear if he has been accepted into a physician’s assistant graduate program but said he would delay entrance this fall if chosen to play in the CAFL. “Why not?” he said. Lam admitted it’s still a long shot for prospects like him. Not only will he be competing for a limited number of roster spots, but also, current members of the Arena Football League are eligible to be drafted without attending a tryout. That might have deterred some prospects from driving to Servite on that bright spring morning, but it didn’t keep Clay Hawkins home. Hawkins grew up in Glenwood Springs, Colorado, kicked briefly at Colorado State and graduated the past May. 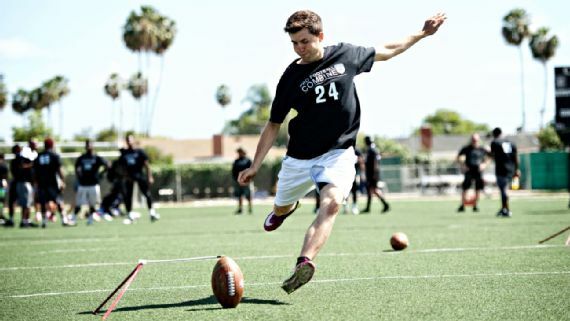 The 24-year-old had not lined up a kick in several years, but he regained the itch and attended a Canadian Football League tryout in early April in Carlsbad, California. That’s when he learned of the CAFL tryout in Anaheim. Once more, he dipped into his savings, built from working at his parents’ bed-and-breakfast in the Western Rockies, and bought a plane ticket to Orange County. “Just being around guys that are trying to do the same thing is pretty neat,” said Hawkins, who planned to save a few bucks by sleeping in his rental car at the airport the night before returning home. Devin Christy learned of the tryout from his mother, who drives a shuttle bus for a rental car agency out of Los Angeles International Airport. Christy’s mother was chatting with some passengers who happened to work for the CAFL, and they informed her of the upcoming tryouts. She persuaded her son to attend and encouraged his friend and former high school teammate, Jabari Mathieu, to give it a shot. Mathieu, a 6-foot-3, 235-pound defensive end, was one of the more experienced and physically impressive players at the tryout, having played at El Camino College, Arkansas State and as a redshirt senior at Arkansas-Monticello the past season. “I’ve got to set an example,” Mathieu said. “Physically and mentally.” With his background, Wang can appreciate someone who beats the odds. He knows that often requires going the extra mile, something he saw in his visits to Austin and Anaheim. “It’s good for us and for them,” he said. “For us, to get players who want to be here, and for them, to get a chance to keep fulfilling their dreams.” Players such as Hamilton, Tsu and Hawkins passed that part of the test. It remains to be seen how they compare to the rest of the competition. The CAFL held tryouts at Servite High School in California for its inaugural season.